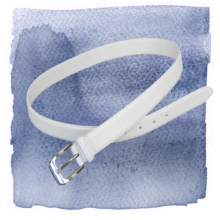 White leather belt with silver buckle. Sizes 29-48. HINT: Tends to runs small, go up one size from your pant waist size. NO RETURNS OR EXCHANGES.